So we’ve spent almost the last week hangin’ with the fam here in Estes Park Colorado, and I have to say it’s probably one of the best places I have had the pleasure of vacationing. Nestled in the Rockies, right on the doorstep of the Rocky Mountain National Park, it’s scenic, laid back and a perfect mix of BFE and civilization. It’s been great. Today I went on the ghost tour at the Stanley here in town, and it was pretty amazing. The history side of the tour alone made it worth far more than the $13 bucks they charge, but the experience I had on the 4th floor set me back quite a bit. For those who don’t know, Stephen King was inspired by his visit here t write the Shinning in the 70’s, and the Hotel has been amazing people for 100 years this Saturday. Built in 1909 by Freelan (F.O.) Stanley, the hotel is an amazing structure, built to make his wife happy during the 5months a year they would spend here in Estes Park every year. I think the bit that struck me most was the fact that Stanley invented the modern process for creating film, and glass plate emulsions. Before this time, Wet Plate Collodion dominated the photographic world. The collodion plates are very difficult to work with, and are very slow, so Stanley inventing a gelatin based plate, that could be automated was a huge boon, and ultimately made him a multi-millionaire before he sold the business to George Eastman. The Stanley Steamer was also invented and produced by F.O. and his twin brother Francis, and some 10,000 steam powered cars were produced between 1902 and 1924. Okay, so back to the hotel tour. We walked through the ballroom, and learned about the stage that was setup for the Shinning mini-series, and how Stephen King stayed in the Presidential Suite #217 when he was inspired for the book. Eventually making our way up to the 4th floor where the nannies and children were quartered, which also happens to be the most active floor with paranormal experiences. This is where I had mine. We walked to the middle hall of one wing to a small square niche in the hall which used to be the play area. We were all then handed a piece of Taffy to hold out in our hand, to see if we could persuade a spirit to interact with it. When I extended my hand with the candy, it almost immediately became chilled in the middle directly around the Taffy. Maybe a 3-4 inch circle just around the candy; not my finger tips, and not my wrist. If I moved my hand, the chill would go away then come back, and after about a minute the sensation became quite a bit stronger and the best way I can describe it is that it was as if someone was sitting in front of my hand blowing on it with a straw, but with cold air. Very strange, and exciting at the same time. This is he first time that I can say without a doubt that I have had a paranormal experience of any kind, and I would really like to go back to the hotel and stay a couple night to see if I could expand upon it; alas not this trip – but I will come back. Awesome! 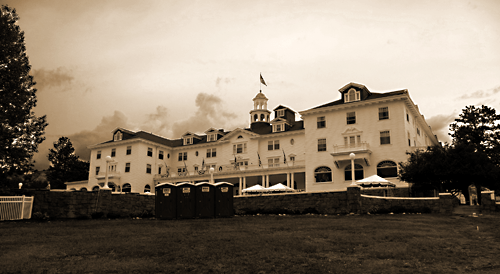 Have you ever watched the Ghost Hunters episodes at the Stanley Hotel? I have seen the show fairly often, just not that episode – I think I will download it from iTunes if they have it….